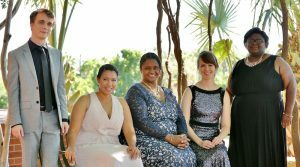 Adelante Winds is a chamber ensemble based in San Antonio, TX that directs its focus on giving a voice to Minority composers, as well as composers of other under-represented communities. Adelante, which means forward, is the ensemble’s mantra in exploring new sounds and ideas for the woodwind quintet. Adelante Winds was founded in 2012, out of inspiration from chamber groups such as Imani Winds, Quinteto Latino, and Quintet of the Americas. Adelante Winds has performed in New York as part of the Imani Winds Chamber Music Festival. The quintet has also performed numerous recitals at several colleges and universities including San Antonio College, Northwest Vista College, and Texas A&M University – Kingsville. The group has collaborated with the Olmos Basin Brass quintet as well as Grammy Award winning percussionist Nina Rodriguez. Adelante Winds had the privilege of performing a showcase at the Texas Music Educators Association convention in 2015 and 2017. Adelante Winds are looking forward to endless possibilities. The group is currently working on commissioning new music, recording, and continuing to collaborate with other artists.